Duravit was among the winners at this year’s iF DESIGN AWARD; the award went to the XSquare bathroom furniture series, created by Duravit in conjunction with the designer Kurt Merki Jr. The XSquare furniture range is both impressive and striking, with contemporary, elegant style. The quadrant-shaped chrome profile which edges the furniture emphasizes its characteristic design. On the floor-standing model, the transition from the body of the furniture to the base is absolutely seamless. The chrome profile accentuates the frame of both floor standing and wall hanging variants and continues around the corner radius of the washbasin, creating harmony and at the same time a distinctly unique touch. 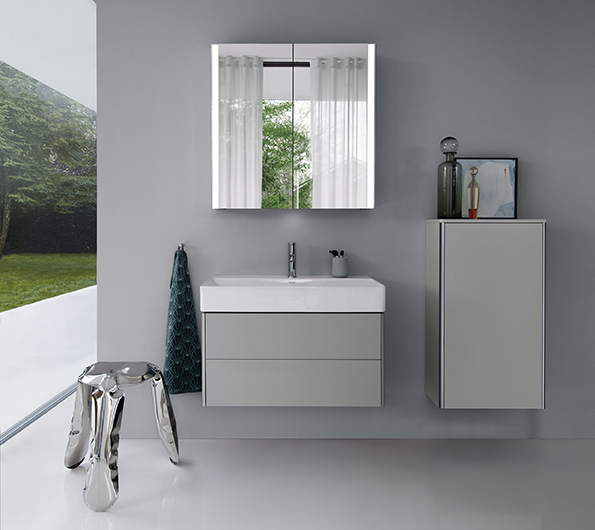 The vanity units, mirrors, and mirror-cabinet solutions from the range are also designed with the elegant chrome profile, enabling a luxurious washing area to be created. Three new, special furniture finishes (Matt Light Blue, Matt Concrete Grey, and Satin-Matt Aubergine) plus the linen décor finish, complete the wide colour palette; there are 28 furniture finishes in décor matt or lacquer; satin-matt or high-gloss are also available. The console panel is available in one of the cabinet colours or additionally in solid Natural Walnut which creates a variety of completely new and individual colour combinations for XSquare. Two or even three colours can be used in combination with the lacquer finish, chrome profile and console panel creating new contrasts and high-class designs. Handle-free fronts with push-to-open technology subtly highlight the elegant and inspiring overall design. The new furniture range has a striking effect, creating clearly structured features in the room. For 65 years, the iF DESIGN AWARD has been a recognised trademark for outstanding design all over the world. The iF DESIGN AWARD is one of the most prestigious awards in the world. It is awarded once a year by the world’s oldest independent design institution, iF International Forum Design GmbH in Hanover. The 67-strong, independent, international expert jury selects the winners of the coveted quality seal from among 6,375 entries from 52 countries.